It is widely accepted that the slow movements of Bruckner’s Symphonies 2 through 5 and 7 through 9 are each in five parts with alternating thematic material and a concluding passage, that is, ABABA + coda. But there are details and anomalies in the filling-out of that paradigm especially in the Fourth Symphony and even more in the Ninth, as well as other recursive features not expressed by that deceptively simple scheme. Particular attention is played to the claim that sonata form applies to these movements, necessarily in a manner different from that seen in the outer movements. Comparisons are also made with movements by other composers which possibly serve as prototypes for Bruckner’s work or as subsequent emulations of it. Sunt lacrimæ rerum, et mentem mortalia tangunt. Bruckner’s extraordinary and deeply emotional slow movements are the beating hearts of his symphonies. In this paper I will consider their architecture, which is central to the presentation of the stories they tell. It is not surprising that most of them would be cast in something called “song form”, which is a name for a basically static, symmetrical structure which can serve as a framework for an implied extra-musical narrative without having a musical purposefulness of its own like that of sonata form. Song forms are usually in three parts, the familiar ABA form seen in the slow movements of numerous symphonies, concertos, and sonatas, as well as songs and piano pieces by composers like Chopin, Mendelssohn, Brahms, and Medtner and others in the general literature, including indeed Bruckner’s own Study and First Symphonies. But by the term “five-part song form” I mean a paradigm of presentation in which the song form is extended to five parts, where B and A are each played one more time, as ABABA. The use of this structure is a well-known hallmark or brand of Bruckner’s mature work. The term specifically does not refer to the form ABACA, which is a simple rondo form especially beloved of Schubert in his late period where he uses it for many piano pieces and for the finales of five of his last seven piano sonatas. In the ABABA cases considered in this paper, compositions of Beethoven, Bruckner, and Mahler, the second and third A sections are successively developed and elaborated, leading to various results as will be shown. Thus the five-part song form as worked out in these examples implicitly requires and generates the character of great seriousness that is associated with the symphonic style. The inaugural appearance of this form in Bruckner’s work is in the Second Symphony, as completed by the composer on September 15, 1872. In part 1, the A1 theme in A flat major has several components. The initial melody, beginning with the downward leap of an octave, begins on the second beat of measure 1. A second phrase begins at measure 5, and a third of double length at measure 9. Then there is a lyrical A2 theme given to the oboe, with pizzicato accompaniment, which becomes a transition to part 2. The B1 theme is a pizzicato chorale of two phrases, beginning respectively in F minor and G flat major, with a distinctive, plaintive countermelody for the horn. B2 presents a series of syncopated rising phrases in thirds, for the strings. Then B1 returns (B1’), in a much fuller orchestration with an arabesque for the violins playing occasionally in unison, occasionally in two parts. B2 returns (B2´), this time for the winds, with the rising half notes given to the horn, which eventually attains the concert C above middle C. Concluding part 2 is an unaccompanied solo for the bassoon, the only one in all of Bruckner’s music. In part 3, the first phrase of A1, eventually only the first three notes of it, are developed in an impressive canon. In the manuscript, the slur covering the second and third notes is only present in the complete melody, but in the print of 1892 where this passage is unaltered, the slur is used even when only three notes are present. I took all the slurs over into the editions both of 1872 and of 1877, and the improvement in clarity of the dense canon is palpable in performances made from my editions. There is little doubt in my mind that in 1892 it was Bruckner who made sure that the slurs were all there. So by means of the canonic development, the first phrase is expanded from four measures to 18. But then that is done, the second phrase returns just as it did in part 1, and Bruckner arrives at the oboe tune (A2) directly by omitting the harmonically ambiguous third phrase. Part 4 brings identical events to Part 2, except that the music is transposed to new keys and the rising notes are given to the cello section. There is no counterpart to the concluding bassoon solo; instead, in rising phrases suggesting an inversion of A1 the music moves toward the dominant of A flat and quiet mysterious notes for the basses. Part 5, however, brings the first phrase of A1 back in the winds with an ornate string accompaniment. The basses throb evenly in the new time signature 12/8, the first violins play an intricate string arabesques in sextole sixteenths, which as the music grows become groups of nine, and along with this already dense texture, interlocking perfectly, there are short dotted phrases in staggered entries for the divided second violins and violas. And there are also competing phrases in the lower winds! This elegant and complex sound has as its forerunner the fuller orchestration of the music in the second and fourth parts labeled B2’ above, but this is two or three levels more intricate without seeming out of place. The music travels to more and more remote harmonies and eventually reaches its highest point in C sharp minor, but suddenly the second phrase intervenes with remnants of the ornate accompaniment retained, and leads to the previously-omitted third phrase, which hovers around D major but then around E flat major which after a few detours is eventually heard by the listener as the dominant of the home key, A flat. Then a most remarkable thing happens: the rising A1-like phrases heard at the end of part 4 return at the end of part 5 and become a direct quotation of the Benedictus of the F-minor Mass (measures 23–26), which earlier that summer Bruckner had conducted to general acclaim at the Augustiner-Kirche. How that happened will be discussed later in this paper. But for now it is enough to say that the concluding serenely-peaceful coda, concluding with a poignant solo violin passage and the famous horn solo which rises to the same concert C that was heard in part 2, makes a lovely and exquisitely-proportioned envoi to this summery movement. In beginning work on his Third Symphony, Bruckner brought in some new ideas from Beethoven’s Ninth, among them being the first-movement A1-A2 double structure of a build-up leading to a unison each time. But in the slow movement of his Third, Bruckner took the formal structures he had already established in the Second and developed them into a somewhat more narrative sequence. Following the A1 and A2 themes, there is a Marienkadenz ( ► Example 1 ) and a concluding lyrical A3 melody in both parts 1 and 3. And in each of parts 2 and 4, the two B themes are in a different time-signature, with B2 being a mini-chorale. But in part 5, following an extensive lengthening and enrichment of the A1 itself like that in the Second, and after the Marienkadenz, there is a new, anxious melody leading to another ecstatic climax and then to his version of the sleep motive from Wagner’s Die Walküre. Perhaps that kind of gesture involving extraneous material was prompted by the trumpet entrance in the slow movement of Beethoven’s Ninth, or by the Dona nobis pacem in Beethoven’s Missa Solemnis. The subsequent revision of this movement, which ultimately destroyed the lovely symmetry of the five-part form of the first concept, will be handled later in this paper. In the slow movement of his Fourth Symphony, marked Andante quasi allegretto, Bruckner was inspired for the opening melody of the A group by the slow-movement theme of the Schubert trio in E flat, as was mentioned in the first paper of this series. The theme is played twice, first by the cellos and second by the winds, and each time it resolves using a special dotted figure which will later be used as a theme by itself. Constantin Floros has spoken of the resemblance of this melody to that of the pilgrims’ procession in Berlioz’s Harold in Italy., which in turn was likened by Mosco Carner in a 1939 article in Music and Letters1 to the slow marches in Beethoven’s seventh, Schubert’s ninth, and Mendelssohn’s fourth symphonies. But the second half of section 1 is devoted to a chorale vignette, which Bruckner called “Gebet”, a prayer; in a pilgrimage, regular stops are indeed made for certain participants to rest and pray, though here the dotted rhythm is maintained in the horns, perhaps to suggest the continuing progress of the others. Although this passage must be grouped in part 1, it really stands outside the form as a special feature. We will see Bruckner doing this same thing in a later symphony, with the most significant meaning. In part 2, beginning at measure 57 in the 1874 version, Bruckner calls for a new tempo signature, Adagio, for the B theme, which is a pizzicato chorale set off by the well-known viola obbligato with sixteenth notes. Benjamin Korstvedt recently reminded me that in Austrian National Library Mus.Hs. 6032, the main source for the early version of the Fourth, Bruckner writes at this point in pencil Die e wie früher die q which for some reason Nowak did not fully replicate in his edition. Also not in Nowak’s score is Bruckner’s ink marking “Ständchen” or serenade. Our pilgrim has said his prayers, and now he sings a song. But at measure 70, long before the onset of part 3, the tempo returns to Andante and the dotted theme from part 1 is given to the horn and developed in a lyrical passage with enhanced orchestration. Eventually part 3 begins at measure 119 with the A or “Harold” theme starting at 121 in the cello again and imitated a measure later in the winds, with the pizzicato accompaniment of the preceding section continuing without a break and becoming more and more complex as the melody is repeated. Part 4 returns in measure 151 to the adagio tempo, the pizzicato serenade, and the viola counter-melody, and after quite a bit of development returns to the andante tempo at measure 191 for the last few bars of the second theme group. Thus in part 2, there are 13 measures in adagio and 38 in andante, while in part 4 there are 50 measures in adagio and only eight in andante. If as Bruckner suggests the tempos have a 1:2 ratio, that is, each adagio measure is as long as two andante measures, which after all is the relationship frozen into existence in the 1878 revision, then the lengths of the two parts correspond to 64 andante measures and 108 andante measures respectively. Most conductors using the 1874 version do something close to that. Indeed it is quite mystifying that Bruckner used this two-stage tempo device. It must be that for the serenade he had a very special sound in mind. It is interesting that in performances of the 1881 version of the symphony, Otto Klemperer always used a solo viola, which does indeed make a very special and intimate sound. Part 5 brings the A theme back in 12/8 with an accompanimental texture reminiscent of that in the Second Symphony adagio, but of an even more dazzling complexity. The music moves from a climax in B major (6-4) at measure 209 to a new wave and texture starting at 213 and moving through the A-diminished chord at 219 to C major (6-4) at 223 with yet a new texture. The harmonies move on, though, and do not reach C major in the root position until 229, all the time with the first violins playing in a torrent of virtuosity. There is, after all this, almost no coda. Later Bruckner mused that he had made the Fourth too detailed, and that passages had been overwritten to the point of unplayability. But today’s orchestras which take up this extremely interesting original version of the Fourth or “Romantic” Symphony have shown themselves to be totally able to render this music effectively and with brio. After all, these are the days in which The Rite of Spring is a repertory piece. The Fifth Symphony served as Bruckner’s virtual dissertation, though he did not receive his official doctorate until many years after its composition, and that was for his renowned teaching, not his compositional achievements. The Fifth was the culmination of his own tetralogy to match his operatic idol’s, The Ring of the Nibelung. Completed only two years after the premiere of Wagner’s work, it arose from Bruckner’s continuous, immense, and inseparable effort of the composition of four symphonies in the grand manner. Each movement of the Fifth embodies an intellectual achievement which builds on the corresponding movements of the other symphonies without minimizing them. That progress is seen in the best perspective when the movements of the first three components of the tetralogy are considered in their earliest and most fully-conceived incarnations. At the end of his work on the Fifth, he said that he would never do anything like that again for any amount of money. That is not to say that he would not go on to accomplish more advanced work, but merely that he would not try to do it all at once on such a huge scale. We will see that he went back on that idea. But in the adagio of the Fifth, he seems to have built on his previous work by creating a specific, narrative contrast in mood between parts 1, 3, and 5 on the one hand, and 2 and 4 on the other, to a much greater degree than he had before. The details of that concept are described in extenso in my paper on the Fifth presented at the seventh Bruckner Journal Readers’ Conference at Oxford in 2011, along with copious notes on specific performances, and here I will only suggest the overview, that the odd-numbered parts are a portrayal of anxiety, disorientation, and despair, while the even-numbered parts are an offer of consolation, hope, and renewal. Part 1 begins with the famous oboe solo with an accompaniment of triplet quarter notes for pizzicato strings, and the melody line continues with a series of alternating sixths and sevenths and a murmuring continuation with no specified tempo variations. The time signature, unique among Bruckner’s adagios, is 2/2 rather than the 4/4 he uses everywhere else, doubtlessly to accommodate the triplet quarter notes. After 18 measures we hear in the strings a kind of anxious pleading, requiring for its proper expression a good sense of how to play chains of four eighth notes against the three triplet quarters of the basses. This is in the position of the “Gebet” in the andante of the Fourth, but it is not built into a separate vignette; after only four measures the triplet rhythm prevails and there is a sense of growing menace. But part 2 begins in C major with an earnest melody in the violins, conceived in even periods, with at first a rich chordal accompaniment for the other strings. But after the first period the accompaniment changes from chords to repeated notes, which seem to make the melody take wings. It is here that in his personal conducting score Robert Heger wrote “Die schöne Stelle” at measure 43 in part 2, and again in part 4 where the same melody returns after a tension-producing delay at measure 123, “Die göttliche Stelle”. In part 2 the melody rises to an ecstatic climax in A flat at measure 63, then moves to C major (6-4), then quietly to A major in preparation for the timely return to D minor at measure 71, the beginning of part 3. It is quite curious that in its first appearance, at measure 31, the “earnest” melody takes a turn which is different from the corresponding place in every one of its 22 other occurrences, both upright and inverted. That is because if the first one were the same as the others, the violins would have to be able to play F sharp below the G string, and Bruckner, as a violinist, knew not to ask for that. It is amazing that nobody seems to notice anything odd about this. Unlike part 1, part 3 contains a substantial crescendo, but again, no specific tempo changes. However, one must remember that in the past, long crescendos were usually automatically accompanied by appreciable accelerandos. Today such a practice if always carried out could seem both vulgar and boring, but perhaps this is a place where we should take the older tradition seriously. And indeed many of the old performances make a substantial dynamic arc in part 3, none more than in an almost unknown but truly astonishing performance from 1959 in which the Boston Symphony plays the Schalk version led by their veteran concertmaster Richard Burgin. At measure 71, part 3 begins solemnly like part 1, but in 75 the melody is transferred to the bass and is enhanced by an extra obbligato decoration for the first violins playing eighth notes in octaves. As in his usual method, already seen in the adagio of the Second, Bruckner continues the development of the beginning of the A theme before turning his attention to its later components, and in that development there is a sudden outburst in F minor at measure 85. From this point Burgin makes his accelerando until measure 95 with the percussion accents added by Schalk contributing to the excitement, and goes still faster until the music breaks off abruptly in measure 100. This extravagant and thrilling effect is not prescribed in the Schalk score, which suggests only a gradual acceleration in measure 98 which is far too late. It was due to Burgin’s genius, perhaps prompted by an overall sense of a certain kind of romantic musical style which was still heard from place to place as late as the time of his performance. I can only say that once one hears it that way, one definitely wants to hear it that way again. After the catastrophe of part 3 and its hushed, fearful echoes, part 4 enters with the warm, renewing melody in the tonic D major. As in part 2, the music rises to a climax, much more muted than earlier, and settles on the dominant of D minor where the flute plays a long, slow arabesque of over 100 notes as the rest of the orchestra waits in expectation of what might follow. This striking, mesmeric dominant preparation is also a vignette of its own, and will have its counterpart in later adagios. Part 5 begins in measure 163 with the unusually specific recommendation “Beinahe Melodie im gleichen Rhythmus wie in Allabreve-Takte, jedoch langsamer” which means “The melody at nearly the same pace as in the alla breve measures, although slower.” It is now in 4/4, which as always with Bruckner simply means that the conductor should beat in four instead of beating in two (alla breve) as in the rest of the movement. Once again the texture of part 5 is very complex, although the passage-work never becomes fast. Against the sextole sixteenths of the violins playing an octave apart, the lower strings render alternating groups of three eighth notes. Across each group of three there is a slur, which here and there requires some cleverness in bowing to make clear. But nothing sounds more heavy and lifeless than not to observe those slurs. Moving through many keys there are three climaxes, each longer than the last, which give the impression that an apotheosis will occur. But it does not; a fourth climax, located on the fringes of D minor and starting in the middle of a measure, collapses with a swift diminuendo, and a very brief coda brings the movement to a close. This movement is a dialogue between despair and hope, and despair prevails at the end. But the symphony is not over. The adagio of the Seventh Symphony is perhaps Bruckner’s most popular symphonic creation, and deservedly so. The whole symphony is full of a uniquely lyrical quality combined with an intrinsic nobility, but even in that context this movement, Sehr feierlich und sehr langsam, placed in the relative C sharp minor, stands out notably for its beautiful melodies and directness of expression. Its construction is quite a bit simpler than that of the adagio of the Fifth, and it has only a single crescendo to the climax in part 5. But it is still on a very grand scale. At the beginning, which is marked at 4/4 in Bruckner’s usual practice, the quartet of Wagner tuben, not heard in the first movement which has just the standard four horns, offer as the A theme a solemn “question” with backing from the lower strings, to which the full strings make a broad rising “answer”. The music continues with an urgent series of phrases which rise further and develop into a memorable contour and an urgent climax. Then comes a transition passage for the first horn, the four tuben, and the contrabass tuba which demonstrates the possibilities of the new instruments in truly Wagnerian style. In part 2, the tempo and time signature change to Moderato, 3/4, the same time-signature change as in the Third Symphony, and a bright but wistful theme appears in the violins in octaves, in the subdominant key of F sharp major. The melody begins in a typical bar-form of 4+4+8 measures. Then the original 4+4 is repeated, but instead of going to the former varied group of eight, it leads directly to a six-measure mini-coda in the tonic where short gestures of the melody are disjunctly remembered. Then there is an eerie, asymmetrical transition of ten measures (4+6) which leads through a ritardando to the beginning of part 3 and the A theme with the tuben. One wonders if the use of the bar-form here is a subtle tribute to Wagner who had so prominently glorified that venerable German musical device in Die Meistersinger von Nürnberg. After the restatement of the two-phrase A theme, the first phrase or “question” is developed several times, then the second phrase or “answer” is similarly treated, rising in volume and using different assortments of instruments. At the climax, the theme is in the full brass with a wonderful active bass line for the contrabass tuba, which should be played sostenuto for the most grandiose effect. The great chorale at the beginning of the Fifth is recalled here, and there is no accelerando with the increased volume of the statements of the theme, only an accumulating majesty. But the magnificence breaks off in a sudden mood of isolation, and part 4 begins with the recurrence of bar-form B theme. A commentator once wrote that the brevity of the second appearance of the B theme shows that the movement’s form is not really a five-part song structure. However, the time-signature changes as it did before, the tonality goes to a remote key as it did before, this time A flat major, and the bar form is given full expression, leading to a cadence in F sharp major. Then the music briefly takers a turn toward E major, the home key of the symphony, but it quickly returns to C sharp minor for the final great scene. What more does one need than all that, to establish the integrity and significance of a formal element? In part 5, both “question” and “answer” of the A theme are given full treatment in the winds with an ornate accompaniment in the strings, just as one would expect from the adagio and andante movements of previous symphonies. There is one continuous crescendo, though, not the multiple waves we are used to, and at the climax, for the first time in Bruckner, the high point is accented with cymbals and triangle. The percussion was made a point of controversy by Robert Haas in his edition of 1944, where he notes that it had been added to the score only at the insistence of Artur Nikisch who conducted the premiere at Leipzig in 1884. But after that, Bruckner did not try to cancel it, although he had the opportunity to do so; the copy of the score belonging to his young acquaintance Karl Muck, with copious directions to the conductor by Bruckner himself, is preserved and can be seen to contain no such cancellation. Besides, in the early version of the Eighth, there are six cymbal clashes which everyone accepts. Haas was under court order to make the new Collected Edition scores different from the old Universal publications or not publish them, and in the Seventh he was grasping at straws. The story is told in detail in Nowak’s introduction to his edition of 1954. The climax is notated in C major, but Paul Nudelman claimed that it is really heard in B sharp major, if that can be imagined, owing to its great feeling of remoteness and alienation. Indeed, it cannot be seen as a worldly triumph, but rather as a vision of a glorious, but distant and inaccessible place of rest. After the music quietly ascends to C sharp major, there is a vignette before the coda: the famous passage for the tuben in the re-established minor, where the first horn suddenly blares out, cutting through the sober texture of the tuben like a hot knife through butter. At a suggestion in the score, conductors often double or multiply the horn part to thrilling effect; there is nothing else like that in all of music. Then the coda begins with the Trauermusik composed by Bruckner at the news of the death of Wagner; this music was quoted by Sibelius at the bleak conclusion of his own Fourth Symphony. Finally there comes a C-sharp-major benediction from the four horns, four tuben, and contrabass tuba which have been all along the sonic foundation of this amazing edifice. The enormous adagio of the Eighth Symphony, though much more complex than the Seventh, is also of crystal clarity. 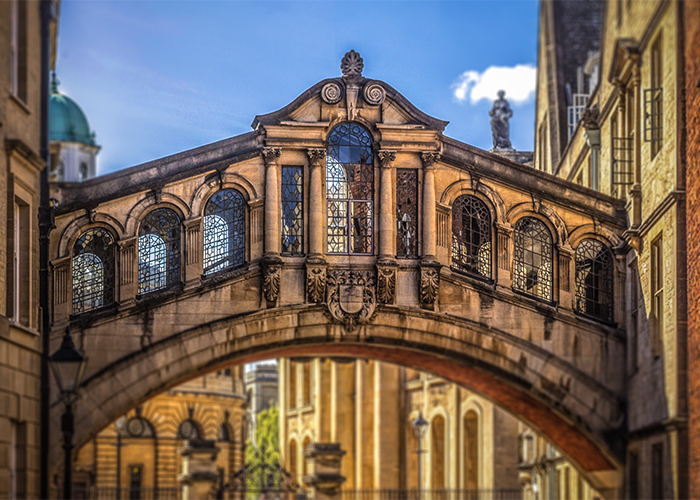 But each part of the vast structure has much detail. As in the Seventh, the A group begins with a double theme, where the first component is a gentle murmur over a rich and syncopated string texture in D flat major, and the second component is a passionate melody which leads to a major climax. After that, there is a brass chorale phrase followed by arabesques for the harp or harps concluding in F major. This is the only symphony in which Bruckner uses the harp, and in this first version, it is only in the slow movement. Then, extraordinarily, Bruckner begins the whole process again, but proceeds immediately to climactic material with the harp eventually concluding in G major. With that simple device Bruckner announces the cosmic scope which this movement is to encompass. The B theme begins in E major with the same warm eloquence as is present in the Fifth Symphony at this point, and also with more than a hint of ecstasy. After a decorated repetition, there is a new solemn theme for the tuben in C major. There is a climax, and then a most interesting thing happens: the time signature changes to 3/4, and in a vignette a short ostinato leads to a plaintive theme in the high winds and an urgent response in the strings. If a narrative subtext can be attached to any part of this movement, it is hard not to think of this passage as a lament by a feminine voice and a reassurance by a masculine voice. In the 1887 version, part 3 begins with the same double theme and a new more impassioned climax, followed by the chorale and the harp filigrees which lead through B flat major with flatted seventh to the beginning of part 4 in E flat, a semitone lower than its appearance in part 2. Here the theme is ornately and canonically developed, and there is a vignette to balance the one at the end of part 2 in which the ecstatic climax is prolonged in a passage of quiet hysteria on the dominant of B flat and a drum roll on F before the beginning of the highly-decorated and boldly dramatic and eventful extended fifth part of the song-form. In my analytical tables of the adagio of the Eighth Symphony, it can be seen clearly that Part 5 is in nearly every performance twice as long as any of the other parts. In that extensive crowning section of this massive movement there are many events and at least four separate buildups to substantial climaxes. Part 5 begins as expected with the murmuring A theme in D flat with a violin filigree and gently moving parts in the lower strings. Then in the first climax there are two quotations of Wagner’s Siegfried leitmotiv, followed by two more crescendos, each seemingly greater than the one before it. Eventually the last of the four crescendos arrives at C major with three cymbal clashes with triangle, which are three more than Haas would allow in the Seventh, and then four measures later three more cymbal/triangle events over the orchestra’s A flat major. Suddenly everything is still, the brass chorale phrase and the harps are heard two more times, the first time cadencing in C flat major, and the second in A flat in preparation for the coda. But there is one more vignette: a recollection of the B theme in a gentle D flat major, which leads fluently to the blessedly long and gentle coda devoted to the melodic ingredients of the A theme and the mellow sound of the horns and the quiet dignity of the tuben. This B-theme passage sounds perfectly at home, but Bruckner had never done anything like that before. Indeed, he seems very reluctant to put an end to the beauty he has evoked in this movement. The revisions Bruckner carried out on the slow movements of the Second, Third, Fourth, and Eighth Symphonies need to be discussed before we turn to the anomalous adagio of the Ninth, while the adagio of the Sixth is in a different form and must be considered separately. Bruckner carried out most of his revisions in two principal periods, the first in 1876–1878 and the second twelve years later. In the first of those periods, almost certainly in preparation for a performance of the Second Symphony to be conducted by Johann Herbeck which did not get past the planning stage, Bruckner deleted the last sixty percent of Part 2, comprising the decorated repetition of the two-section B theme and the unaccompanied solo passage for the bassoon. The revisions to the Third Symphony, made in 1876–1878 and 1889–1890, were much more drastic. In the earlier revision period, part 3, devoted to the A theme, was completely deleted along with the first third of Part 4. This could be done easily because the second principal entrance of the B theme in the 1873 Part 4 was in E flat major, which was the tonic key and thus the key in which the former Part 3 began. The result of this hatchet job was a sort of approximation to the three-part song form ABA, but with none of the symmetry and balance inherent to that form because of the bloated size of the resultant B structure which was already a bit unwieldy in the original version of 1873. One must remember that in this adagio, Bruckner went beyond the two-theme structure in parts 2 and 4 of the adagio of the Second, developing his themes much more fully than in the earlier symphony. Thus when the cut was made, all of the formal proportions of the music which was retained were thrown out of kilter. People like it anyway, of course, because every measure is beautiful, but as a whole, the movement does not make sense in the most elementary way. Then when 1889 arrived, Bruckner made still more cuts in the former Part 4 material and things only became worse. This is not to say that other changes he made at those times were not beneficial. For more details on these issues, see my paper on the Third, “Bruckner’s Trumpet”, given at the Readers’ Conference of 2013 and subsequently published in The Bruckner Journal as “Evolution of Brass Writing in Bruckner’s Third Symphony”. By 1876, Bruckner had already come to repent himself of the complex canonic textures, intricate rhythms, and microscopically detailed string writing he had built into his Fourth Symphony, and in 1878 he arrived at a new version of the symphony, with substantial rethinking of the first, second, and fourth movements and a completely different scherzo. At that time, in the slow movement he suppressed the two-tempo scheme described above and made many other changes in details and structures. One of these involves a passage in part 2 somewhat after the viola serenade, where in 1874 there is a passage of cheerful, rhythmic music without a prominent melody. In the revision of 1878, Bruckner realized that he could introduce the A theme in the major mode at this point in part 2 while retaining the basic character of what was already there. For Bruckner, who rarely mixed the B themes even in his developments, this was quite a bold gesture. Then at the end of that same part 2, there is a new transitional passage in which groups of four chords, derived from the pizzicato chorale of the B theme, are tossed back and forth among various groups of instruments, leading forward to the re-introduction of the A theme at the beginning of Part 3. In keeping with the theme of this movement as a procession, this passage has a mysterious and even bleak character, as if the pilgrim were picking his lonely way across a field of stones. But in the next revision which reached its goal in 1881, most of this passage was replaced by a few chords for the low brass which brought the A theme in some twenty measures earlier. The final revision of the symphony in 1888 made a severe cut in the scherzo da-capo and structural changes in the finale, but no major formal revisions in the other movements. The revision of the Eighth Symphony is an enormous topic, mostly because we have a huge number of surviving sketches for this symphony which we do not have for any of the earlier ones. For the individual changes that were made over the five years of revision, 1888–1892, one must turn to the exhaustive treatment in Paul Hawkshaw’s brilliant critical report on the Eighth. But complex as this history is, it seems that there were no large structural rethinking of the Adagio even though a lot of revision was made in it. Of particular interest to us is the alteration Bruckner made to the vignette at the end of Part 4. In the 1887 version that vignette contained canonic writing of fragments of the B theme, with legato accompaniment by the strings and a pedal point on F. But in the revision process, probably as early as 1888, Bruckner revised this whole passage, simplifying the writing somewhat, raising the pedal point to G and at the end to A flat, and making the viola accompaniment pizzicato. The result is a remarkable passage of total alienation, resembling in many ways the vignette added in 1878 at the end of Part 2 of the andante movement of the Fourth as described in the previous paragraph, which was discarded in 1881 but apparently not forgotten. Thus, in the metaphor suggested above, where at the end of Part 2 the young, bright, and attractive Marie Dehm, who spent a lot of time with him while he was revising the Eighth, tells him that she can be no more than a friend while he urges her to trust him, at the end of part 4, we may imagine the bachelor composer slowly walking home by himself through the deserted dark streets of the great and lonely city. Still, though, such is Bruckner’s character that he can return to the portrayal of earthly love in part 5 of this movement with noble and confident optimism. The adagio of the Ninth Symphony sounds much more regular than it is. Without fail, the ear hears the five parts of the song form, which has come to be a familiar aspect of the Bruckner brand. This music consists of four short chorale phrases of four notes each for the four tuben, with the upper pair of horns doubling the first tenor tuba in the first and third phrases, while the strings continue the accompanimental texture used with the Cross motive. Short four-note phrases of this character are found at many other places in Bruckner’s music: even as early as in the first theme of the Second, just before the recapitulation in the first movement of the Third, and then near the end of the first movement of the Ninth. But here they are built into a theme of a special significance, as asserted by Bruckner himself, which gives complete assurance to the mind of the listener that this symphony is about “last things”. Thus here again there is a vignette like the “Gebet” at the end of part 1 of the andante of the Fourth, which stands to some extent outside the form as a special feature, though it does have a fragmentary recurrence near the end of the movement, in the hush after the great dissonant climax. Again it is a prayer, and this time the pilgrim is near the end of his journey. After twelve bars, the rising figure of A2 recurs, and leads to part 2, where the new B1 theme in A flat major is warm, gracious, and comforting, even though it begins with the rhythm of the Farewell to Life. Listeners will also recognize in its first four notes an inversion of the codetta theme of the first movement of the Third Symphony, in turn quoting the “Miserere” of the Gloria of the Mass in D minor (measures 100–103). Then, as in the Second and Third Symphonies, part 2 offers a second theme or B2, a lush and ornate episode in G flat major, densely accompanied and rising to an ecstatic climax with no help needed from the brasses. The writing is so complex that it is difficult to imagine that this section spans only eight measures. B1 returns briefly and the horns take up the theme, but the music drops away to a French sixth chord for the tuben and a despairing flute solo. As we have seen him do before, in part 3 Bruckner develops the first part of the A theme far beyond its treatment in part 1, here continuing with a restatement of A1 by the strings a whole tone higher with the flute playing the theme inverted and entangled with the violins, leading to a striding fortissimo with the opening notes of A1 proclaimed in canon, both upright and inverted, by the brasses. Then quietly an augmented allusion to B2 is made in place of A2, and through a crescendo with repeated iterations of the beginning of A1 the Cross motive climax is reattained, a semitone higher than in part 1. But there is no repetition of it, nor any mention of the Farewell to Life. Instead, part 4 begins immediately with B2, now in A flat, a whole tone higher than before. This time it is extended to ten measures, but then it breaks off and the anomalies begin. In fact they have already begun because part 4 should have started with B1. Instead of that, Part 4 continues with a treatment of fragments of A1. There is a recollection of the descending chorale from the finale of the Eighth, and then against a steady ostinato of eighth notes from the oboes and then the clarinets, the beginning of A1 and its inversion are played again and again as the tension rises to an almost unbearable level. In parts 1 and 3, that sort of treatment of A1 led to a cross-motive climax, but now it breaks off abruptly, leaving the ostinato by itself, and the following material turns out to be B1 in the home key of E major. However, this is not the reprise of B1 after B2 that we heard in part 2; it is instead clearly the beginning of a grand crescendo, where right at the outset the theme is given the complex decoration which we have learned to expect at the beginning of part 5 in six previous song-form adagios. For that reason I have placed the Part 5 designation at this point in my analysis, irrespective of the thematic incongruity; the beginning of Part 5 is what the ear hears. And the crescendo makes one grand sweep, the wind parts becoming ever richer and more complex and insistent, until only 26 measures into part 5, A1 enters in C sharp minor in canon in the brasses. Near the end of this terrifying outburst, the canon breaks off as A1 completes its curve, on a chord which contains all seven notes of the C-sharp harmonic minor scale, complete with its intrinsic augmented second. Then after a fermata which must necessarily be quite long, the rest of the elements of the A group begin to reassert themselves. But instead of moving to a fourth statement of the Cross motive, the “Miserere” theme from the D-minor Mass and Third Symphony heads the movement toward quiet resignation in E major and the perilous high B for the four horns in unison. Thus we see all the formal elements of the five-part song form still present in the adagio of the Ninth, but in the latter parts the ingredients are somewhat out of order and set at odds with each other. It might be possible to regard the A1 section in part 4 as a vignette that occupies two thirds of the part in which it is present, but then there is the fact that part 4 starts with the wrong theme. Nonetheless that is what the ear hears, and that is the only way in which Bruckner can convey the emotional message he has for the sympathetic auditor. This movement, with its alternating moods of agony, divine appeal, revelation, premonition of death, earnest comfort, and prayerful ecstasy, all bound together thematically, reminds me of Strauss’s tone poem Death and Transfiguration of 1889. In the Strauss, which after all is coeval with the completion of only the earliest parts of Bruckner’s Ninth, there are the agonies of approaching death, fond recollections of childhood and happier times, and continuing engagement with the still-incomplete efforts of maturity which can only be fully resolved through the transfiguration attending the protagonist’s death. But in Bruckner these humane thoughts are also accompanied by the constant assurance of divine intervention no matter what the state of his life might be at the end. In the volume Bruckner Studies (Cambridge, 1997), there is an erudite and sympathetic article by Edward Laufer on prolongation methods in the Scherzo and Adagio of the Ninth, with 22 ornate Schenkerian analyses and re-analyses of many passages from those two movements, some of them spreading over two pages. He also presents an overall analysis of the adagio as a sonata form, with the exposition being parts 1 and 2 of the song-form, the development being part 3, and the recapitulation being part 4 and part 5. I have entered Laufer’s analysis on my own analytical table. His sectional account is much less detailed than mine, but the locations of the section divisions are unambiguously stated by him, and the validity of his diagrams does not depend on the structure he proposes. If one accepts parts 1 and 2 as an exposition, and the rest of the movement as a Brucknerian counter-statement or developed recapitulation, one arrives at the structure A B1B2 | A B2A B1A, in which Laufer would say that the recapitulation begins at the recurrence of B2. In no way does such a concept clarify the effect of this movement on the listener, nor are the goals of sonata form such as the “effective expositional closure” of Hepokoski and Darcy achieved here. Indeed, the sonata-form paradigm, with its arrow of sonata process, fits this movement about as well as Balzac’s working-cloak would fit the Venus de Milo. This is not to say anything negative about the Schenkerian analyses which are very penetrating and revealing. Indeed Laufer concludes with some force that his Schenkerian analyses refute Schenker’s own deplorable offhand and pejorative remarks about the compositional methods of his teacher and friend Anton Bruckner. Unlike Bruckner’s three-theme exposition, the subject of the first paper of this series, Bruckner’s five-part adagio has two clear antecedents: the adagio of Beethoven’s Ninth Symphony in D minor, Op. 125, and the adagio of his fifteenth string quartet, the Quartet in A minor, Op. 132. The Ninth Symphony adagio could be said to represents an enlargement of the form of the adagio in Beethoven’s monumental piano sonata, Op. 106, called the “Hammerklavier”, which could be characterized as ABAB with a short coda based on A, or because the second B returns to the tonic F sharp, perhaps a sonata form although with only the briefest of developments. In the symphony, the second appearance of the B theme is not returned to the tonic B flat major, and instead a decorated version of the A theme group, although beginning in the tonic, leads to a pair of trumpet outbursts in E flat recalling the military music in the Agnus Dei of the Missa Solemnis composed just previously in Beethoven’s life. These events all have their counterparts in the Bruckner movements discussed so far in this paper, and Bruckner considers it optional to return to the tonic in part 4, thus further distinguishing the ABABA scheme from sonata form. The quartet movement is labeled by Beethoven as “Heiliger Dankgesang eines Genesenen an die Gottheit, in der lydischen Tonart”, or “Sacred hymn of thanksgiving of a convalescent to the Godhead, in the Lydian mode”, and despite its unique character it is much closer to Bruckner’s methods. The hymn is presented by Beethoven in four eight-syllable long-meter phrases in half notes, each one introduced with a brief non-hymnic passage comprising eight quarter notes. Both Bruckner and Wagner presented chorales this way, with interludes between the lines of the hymn, Bruckner in the Fifth Symphony, and Wagner at the beginning of Die Meistersinger. 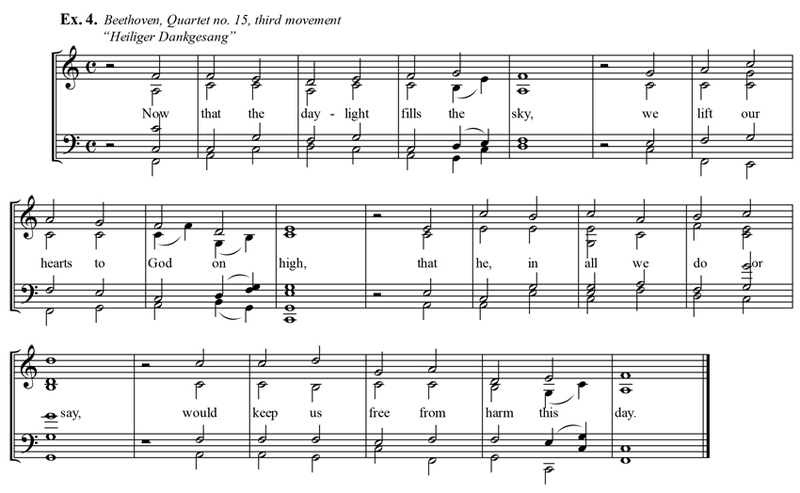 The hymn itself is shown here, ( ► Example 4: Beethoven Quartet no 15 ) where the introductory passages are omitted for clarity and the hymn is presented as it would be in a hymnal. I’m suggesting for words the old Ambrosian hymn for the office of Prime, Jam lucis orto sidere, which in Neale’s translation seems quite appropriate. Beethoven probably knew that most “Gregorian” office hymns in the Catholic Church are in that meter. One can in this way easily hear the hymn’s decidedly odd, yet quite self-consistent Lydian harmony, and its sober joy. In the quartet the last line is repeated, as is often done with last lines in certain congregations, and the concluding harmony made to turn toward the tonality to be used for the B theme. This is done in both parts 1 and 3 of the quartet adagio, while parts 2 and 4 are given over to contrasting music in a contrasting key with a different time-signature as was also done in the symphony. Part 5, not part 4, brings a return to Lydian F major, and a development of phrases of the chorale with an ornate accompaniment, leading to a strong climax and a short coda. This structure is very close to Bruckner’s methods and proportions. Thus this movement cannot be said to be in sonata form, just as the adagios of the Bruckner symphonies 2, early 3, 4, 5, 7, 8, and 9 are not in sonata form. Two slow movements among the symphonies of Gustav Mahler also demonstrate the five-part song form, those of the Fourth and Sixth Symphonies. Whether that is in imitation of Bruckner or directly of Beethoven is difficult to say. The G-major adagio of the Fourth, widely accepted as depicting an idyllic childhood landscape, has proportions quite close to those of the Beethoven Ninth adagio, with the huge E-major outburst near the end of the Mahler mirroring the E-flat trumpet calls in the Beethoven, and Bruckner does not do anything quite like that. And the succeeding finales of the two symphonies could hardly be more different, even though they both have vocal elements. As for the andante of Mahler’s Sixth, properly placed second among the four movements, it has the same form but quite different content, even though it too depicts a childhood scene, that of the nursery and the rocking of the cradle. It has no coda at all; in that respect its closest antecedent is the adagio of Bruckner’s Fifth, although again it could hardly be more different in content and significance. There are also two of Mahler’s finales which employ the five-part song form, that of the Third, whch alone among the movements considered in this paper ends with a blaze of glory, and that of the Ninth, which is the only one of these movements which actually goes beyond Bruckner’s harmonic and contrapuntal idiom. The bar graphs show only the basics of the formal elements; for further details one should consult for example the essential account by Constantin Floros, Gustav Mahler: The Symphonies, Amadeus Press, 1993. At the very least, one sees from these fifteen examples that the ABABA form has multifarious possibilities on the grand scale! Searches among other composers can be made. For example, Franz Schmidt’s four symphonies have slow movements in ABA, through-composed, or variation form, Siegmund von Hausegger’s interesting and imposing Natursymphonie has an adagio which despite its ample length of nearly twenty minutes is in ABA form, and Wilhelm Furtwängler’s monumental Second Symphony has an adagio in ABACA form. Other composers whose work should be examined are Hans Rott, Richard Wetz, Siegfried Wagner, Felix Weingartner, and Otto Klemperer. But the political, economic, and aesthetic destruction which came about because of the calamitous First World War produced a climate in which most composers adopted an eclectic individualism in which twenty-minute adagios sizable enough to accommodate the five-part song form would not be expected to be attempted. Now are discussed Bruckner’s adagios which do not follow the five-part structure, but some other plan. These are those of the Quintet, of the Second Symphony as briefly conceived during the process of composition, of the Sixth Symphony, and of his early Study and First Symphonies. The Quintet adagio, which has also become popular as an independent movement for string orchestra, has four parts, ABAB, much along the lines of the first four parts of the adagios described above. But following part 4, there is simply a coda in the tonic key of G flat major in which the A theme is recalled, but not stated or developed. Thus it resembles the adagio of Beethoven’s Hammerklavier piano sonata, Op. 106, except that the second B theme is not in the home key as it is in the Beethoven. For that reason, I would hesitate to ascribe either five-part form or regular sonata form to the Quintet adagio. The Quintet adagio has a little-known and probably-never-to-be-played forebear which belongs to the early phase of composition of the Second Symphony. In July, 1872, while in Vienna, Bruckner completed the adagio in the form ABAB coda. The status of the movement at that time can be approximated simply by the omission of measures 150–187 of my edition of the 1872 version. Just as in the Quintet, the form of the movement closely mimics the adagio of the Hammerklavier. But later in the summer he added Part 5, simply placing it between the cadence at the end of Part 4, which seems to refer to measures 22–24 of the Benedictus of the F-minor Mass, and the beginning of the coda, which is a reminiscence of the A theme. This process presented him with a problem: how at the end of part 5 could he produce a passage which would lead to the coda even more effectively than the passage at the end of the existing part 4 which was already designed to do that. He did that by making the new second cadence a much closer quotation of the Benedictus, adding a measure for emphasis. Later in the decade Bruckner had second thoughts about this trick, leaving behind a tangle of revisions and conflicting metrical numbers discussed in an interesting and influential early paper by Timothy Jackson 2 . A relic of this peculiar history might be the unusually long coda of the Second, compared to the codas of the next three symphonies. Bruckner would naturally have been reluctant to change something as lovely as what he had already written, especially since Beethoven’s Ninth says that it is all right to have a coda that long. Also, the Quintet of seven years later has a long coda, perhaps to make up for the missing fifth part, although the coda does not have anything like a full statement of the A theme. The Sixth Symphony is in many ways a special case. Here the sonata paradigm suggests itself strongly; there is a well-defined exposition of two themes, a development, a recapitulation of the two themes, and a coda. It is certainly possible for the sonata paradigm to be used in a slow movement, where the exposition and recapitulation do not need to conclude with the gathering excitement that is a hallmark of the use of the form in allegro movements; so much is demonstrated in Mozart’s 40th symphony, and in a myriad of other compositions, even including the sonata-form slow movement in Bruckner’s own D-minor symphony of 1869. But this is not Bruckner’s usual sonata form. Particularly there is no rhythmic, unisonal third theme to balance the first theme, the two surrounding a lyrical, episodic song-theme period. Instead, in the exposition there is a quiet vignette following the two sections of the B-theme group which has the character of a funeral march, and in fact is so striking that the ear does hear it as a third theme. But in the recapitulation, instead of following the two-section B theme, the C theme is sandwiched between them. A seen here and elsewhere, this is not the only structural innovation present in the Sixth Symphony, where Bruckner was seeking ways to continue writing symphonies without the obligation each time to surpass in scope his just-previous effort. But here this thematic relocation in the Sixth, the placement of melodic elements out of traditional order, has as a counterpart the more extensive relocation of thematic elements in the Ninth, where part 4 is devoted to B2 and A rather than to just B, and part 5 is devoted to B1 and A rather than to just A. Thus the division into parts in this movement is not predicated solely on thematic recurrence, but instead also on the evolution of texture; in the Ninth, the beginning of part 5 sounds like the beginning of part 5 in the other song-form adagios, never mind that it is the “wrong” theme. And it is surely significant that at the time he was writing the adagio of the Ninth, he had completed the preparation of the Second for publication and was working on preparing the Sixth. Melodic phrases from the Second and Sixth are the most prominent borrowings in the Ninth, and it is very satisfying to see Bruckner’s will to innovate very much alive in his last days, borrowing from two symphonies which were themselves notably innovative at their inceptions, and taking from them the idea of structural innovation as well as certain melodic contours. In the Sixth, the thematic relocation makes for a smooth transition into the extended coda in which the descending octave scale of the A theme is reversed. In the adagio of the Ninth, the thematic relocation sets in opposition all the elements of the emotional arch of the first three parts of the movement, and makes possible the last entrance of the A theme to be made fortissimo, to terrifying effect. Bruckner never had done that before, and this is the means by which he did it, with all good will totally deceiving the listener into thinking that the movement would end in triumph or at least reconciliation, and then bringing forth all the agony and striving of the A theme at the top of the crescendo, leaving only the quiet later parts of the theme to come to rest as well as they can, deferring the full resolution to the finale which he tried so hard to make complete. The adagios of the Study Symphony and First Symphony are in three-part song form, and they are included on the series of bar-graphs visually displaying the structure of Bruckner’s slow movements and their prototypes and metatypes. It is worth noting that although the structure of these two movements is relatively simple, upon hearing they sound quite mysterious. This is partly because in both movements the first theme begins in the bass, but there are other complications absent in his next works, the adagios of the D minor and Second Symphonies which are formally transparent. For this reason and for many others, no conductor’s series of recorded Bruckner symphonies should be considered complete unless it includes both un-numbered symphonies. They would be considered masterpieces in the œuvre of any other composer. Wonderful article! Thank you very much dear Prof Carragan. Thank you Martin! Enjoy it and let me know if you have questions. The earlier Adagio (1865/66) of B1 was not yet in three-part song form, but in sonata form with development – alike the B D minor.